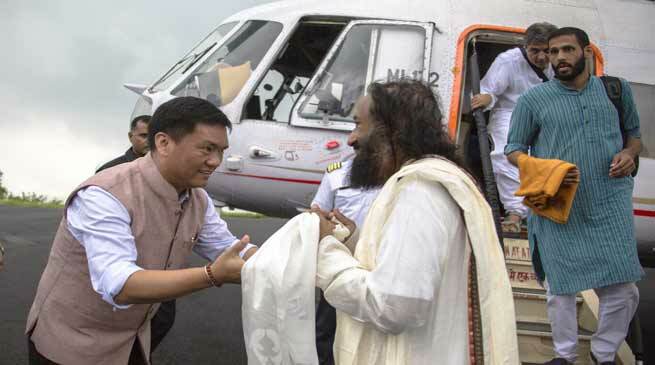 Chief Minister Pema Khandu today accorded warm welcome to Art of Living (AOL) founder, Sri Sri Ravi Shankar at Raj Bhawan helipad, accompanied by state BJP president Tapir Gao, Deputy Chief Minister Chowna Mein, Chief Secretary Shakuntala Gamlin along with other officials. Following the reception, the Chief Minister accompanied Sri Sri to state banquet hall to attend a lecture on ‘political ethics and challenges in the context of changing times’. On arrival in banquet hall, school girls dressed in traditional attire chanted the ‘mangalacharan’ in honor of Sri Sri. Earlier, the session started with the lighting of lamp. Sri Sri in his address to the legislators and state’s top officials gathered appreciated the Vedic chanting of ‘mangalacharan’ by the girls. He said it requires great pronunciation skills to chant it to perfection. Impressed at the performance of the girls, Sri Sri said Arunachal will bring revolution in women’s empowerment. Speaking on today’s theme, Sri Sri said politician have to work a great deal to win the trust of the people. He said if people’s trust is won, then there is no need to spend money in election. He said we must all follow the ethic of not doing things on others which we don’t want on us. He said sense of belongingness must develop to evolve a better system of governance. He advised that one must not be discouraged by criticism and continue to work for betterment of society, which will generate tremendous energy to work more. The lecture session was followed by question answer round, which was participated by legislators, public leaders and officials. Earlier Speaker TN Thongdok delivered the welcome address. In his speech, he appreciated Sri Sri effort in negotiating with ultras in Northeast to come back to mainstream. Sri Sri later visited the AoL campus in Jollang where he was given warm welcome by the devotees dressed in traditional attire.